Debbie Dean, pictured, and her husband, Dennis, are opening A House for ME in Kittery. A House for ME is a nonprofit offering housing for those with intellectual disabilities and autism spectrum disorders in York County. 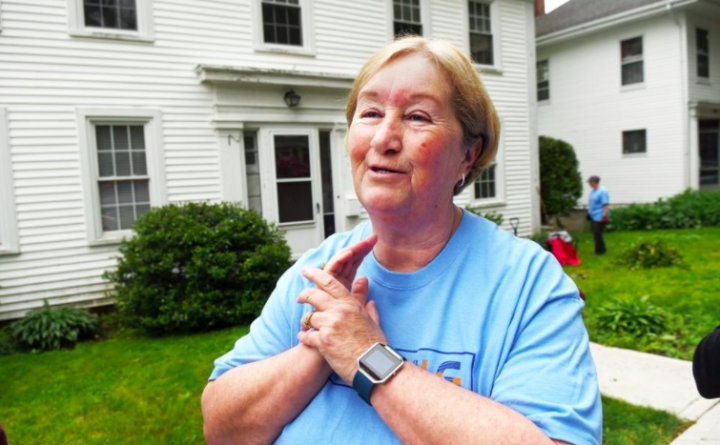 KITTERY, Maine — In 2013, nearly 800 people were ahead of Dennis and Debbie Dean’s disabled daughter on the state’s wait list for housing. “Something new has to happen and we hope we’ve landed on it,” Dennis said Wednesday while standing in the second floor bedroom of an 1860 home on Government Street, the parsonage of the Second Christian Congregational United Church of Christ. The Kittery couple started A House For ME, a nonprofit opening the door to independence for those with intellectual disabilities and autism spectrum disorders in York County. In May, the organization secured its first home, when it signed a five-year lease on the Kittery house. Three women will live there together, beginning in July, including the Deans’ 38-year-old daughter. They still seek their other two tenants. “Of course our first intention was with our daughter, but we really want to open more homes,” Debbie said. The houses will have volunteer support staff to assist the residents, and the organization is working with the University of New Hampshire to offer those opportunities to graduate students. The goal is to create “circles of support,” a “beehive” of community. A House For ME has received its funding through grant writing and “a lot of amazing community fundraising,” Dennis said, noting support from the Kittery Lions Club, Kittery Rotary, Kiwanis Club of the Seacoast and the Congregational Church in Kittery Point. Tenants will pay 30 percent of their income in rent, and then contribute to household expenses. Dennis said responsibility is one of the things they’re trying to foster in the living environments. On Wednesday, as part of United Way of York County’s annual Day of Caring, employees from Portsmouth Naval Shipyard were on site to clean up the house, landscape and prepare for its incoming residents. “I really feel honored to get to do this, it’s really nice to have that fellowship,” said Catherine Sullivan, a shipyard employee and 40-year Kittery resident. Thirteen people now sit on the organization’s board, which Oplinger said also has a responsibility to advocate for affordable housing implementation in surrounding towns’ planning processes. For more information, visit ahouseforme.org.